Most probably due to importance that Internet Marketers, Bloggers and other professionals give to Email Marketing, there has been a noticeable rise in number of email marketing solutions recently. MailChimp, currently used by huge number of professionals, is one of such marketing solutions that have grabbed spotlight. Nevertheless, MailChimp is not the best email marketing solution, especially when we have found an innovative yet effective alternative for that product — SendinBlue. We tried SendinBlue as a way to create, send and track newsletters, and we were extremely impressed that we decided to do a review of the service. In this review, however, we will be considering SendinBlue rather as an effective MailChimp alternative than an individual service. We hope that due to the latter’s popularity, it would be easier for you to clearly understand more about SendinBlue. First of all, we hope we should give you a brief overview of SendinBlue so that you can know, what SendinBlue can do for you. When put in simple words, SendinBlue is an internet service that lets you send hundreds / thousands of emails using one click rather than sending each email one by one. Suppose your blog has a huge number of subscribers, and you’d like to offer them some sort of freebies or gifts; in such situations, you can use list of emails to send them a mail that consists of everything you want to share. Due to the fact that MailChimp also does the job, we can call SendinBlue as MailChimp alternative (well, usually, ‘alternative’ depends upon chronology, you know). Alternatively, as we said earlier, it’s an email marketing solution for both newbies and advanced professionals. Now, we would have a glance on various aspects of SendinBlue along with a comparison with those of MailChimp. Although we call it an email marketing solution, SendinBlue is an integrated solution that lets you move on with your marketing campaigns through two ways – Traditional Email and SMS. So, you can collect email IDs & mobile numbers from your users/readers, so that you can have an optimum blend of marketing. You can use marketing email section to keep in contact with your customers, send newsletters, and send confirmation emails etc, whereas SMS would be very helpful in sending promotional SMSs or some more confidential data such as One-Time-Password. Thus, blend of SMS and traditional email in SendinBlue makes enough sense. When it comes to MailChimp, however, offered services are limited to traditional email. Resembling the former, user can use MailChimp to handle both promotional and transactional email without depending upon another service. So, particularly if you consider SMS as a great way to promote your brand, product or service or keep in contact with users, you should prefer SendinBlue to MailChimp. When it comes to email marketing, contacts are the most precious thing! If you have more contacts, your marketing campaign will reach heights in no time, and vice versa. In that respect, managing contacts is an important factor that has to be considered while reviewing an email marketing solution. SendinBlue offers different methods to upload a set of or individual contacts to your account. You can add new accounts by uploading .csv file that consists of all your contacts, copy and paste a list of contacts or manually adding account individually. Once you have uploaded contact list, you can see them in ‘Contacts’ section of SendinBlue. In addition, ability to use ‘Lists’, instead of selecting contacts from the big list, makes contact management in SendinBlue an easier task. Also, you can edit individual contacts as you wish. Altogether, contact management is something a great deal, indeed. In addition, using integration features offered by SendinBlue, you can create a connection between your blog or site and SendinBlue account. By doing so, you can almost automate the process. For instance, if you place a subscription form from SendinBlue in your site, everyone who subscribes to your blog will automatically be added to contacts you have in SendinBlue account. In MailChimp, things are a bit different. Despite the fact that it is also following a list-based contact system, it seems to take more time for a common user to understand contact management in MailChimp. First, you have to create a list and then add contacts into that list, by your own or using signup forms. Drag and Drop Email Creator: In this form of email creation, it is all about dragging and dropping elements you’d like to see in your newsletter. You can add images, text, links and everything else. 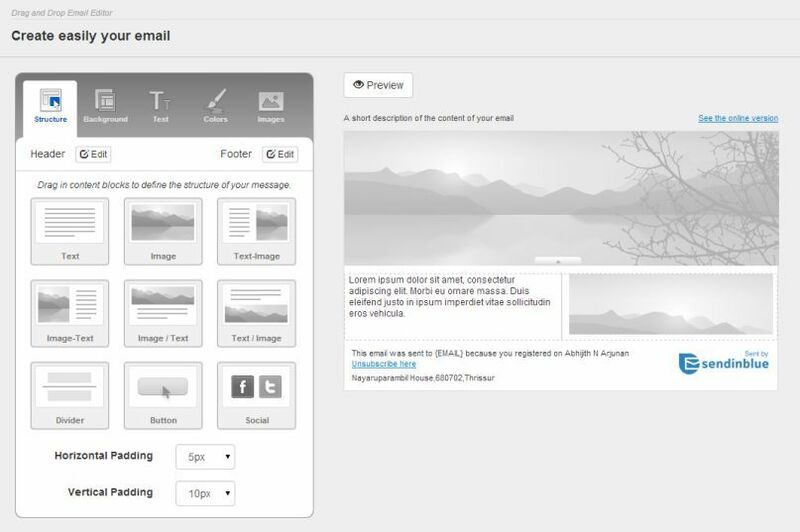 UI of drag and drop based email creator is something worth praising. What You See Is What You Get Editor: If you are familiar with Blogger / WordPress editor, you can go for this. In this form of email creation, you can type what you want to see, format it and publish it. Simple as that. Responsive Design Builder: This will let you design your newsletter in such a way that it suits different devices, your customers will be using for read your newsletter or email. This is also a sort of drag and drop, despite the fact that it is possible to edit every part of it. On the contrary, when it comes to MailChimp, email creation is all about templates. Despite the fact that it might be impressive once you have experience with it, the UI is not intuitive when compared to that of SendinBlue. In a marketing campaign, it is inevitable to track your emails and SMSs in such a way that you will be able to optimize your marketing strategy to gain maximum conversion. 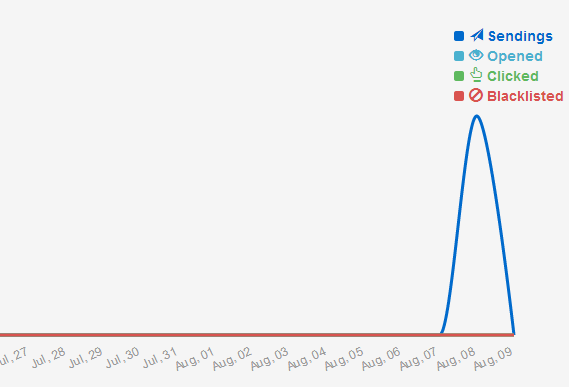 If you are using SendinBlue, tracking your marketing is an easy task. Best part of SendinBlue is that it offers real-time tracking for every mail or SMS you send through the platform. A few features help marketers to analyze their email marketing endeavors. Web hooks are an impressive way to analyze whether your readers respond to your emails. By attaching a webhook, you will able to know if a user opens and reads your mail or newsletter. In addition, if you purchase the pro version, you can have a look on, where your readers click most. Altogether, tracking section of SendinBlue is just awesome. MailChimp also offers a tracking system for tracking emails or newsletters you send to your customers. However, in light of our experience, we think the UI of SendinBlue is better, especially for a beginner, as everything is available from dashboard! Here is where we find SendinBlue as the savior of newbie and intermediate web-based professionals, who are still on a tight budget. To fix these issues, SendinBlue has come up with variety of plans along with the impressive free plan. Using the free plan of SendinBlue, you can send 300 emails each day with no restrictions in number of subscribers. In that way, you can send 9000 emails per month. If you upgrade to the next plan, named ‘Micro’, you can send 40000 mails per month, whereas Atomic Plan will be able to provide 15000000 emails per month. Also, when you upgrade, you can get rid of daily email limit. You can know more about pricing of SendinBlue in their official page. When it comes to sending a huge number of emails per month, we are sure that MailChimp will disappoint each and every marketer with tight budget. You can go to this page to know more about difference in pricing and plans. Now, it is time for decision! While recalling what we have said earlier, in different sections, it is clear that SendinBlue is an awesome alternative for MailChimp, particularly if you are looking for an affordable, intuitive and effective way to mail your emails, newsletters and transactional emails in a few clicks. Especially, we loved the newsletter builder and different pricing plans. What do you think about SendinBlue, by the way? We are eager to know.